This fast acting carpet spotter is enhanced with surfactants and wetting agents that immediately remove most spots, including dirt, coffee, grease, and animal urine. The forceful spray and non-foaming formula quickly penetrates for fast spot removal. Ideal for use as a pre-spotter prior to carpet extraction. The 19-pound Bravo™ spotter delivers incredible efficiency and power in a deceptively small package. Featuring a 1500 watt, in-tank heater that delivers high heat in minutes, the Bravo™ is ideal for spotting and quick cleaning of small carpeted areas, upholstery, and auto interiors. 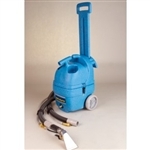 Includes 8' hose assembly and 1039AC stainless steel upholstery tool. 1500 Watt, in-tank heater delivers 150 degree heat. 2 year on parts & labor, lifetime on rotationally-molded housing. The Galaxy 5™ was designed for remarkable heat and power all housed within an incredibly lightweight and portable package. The exclusive external heater design, with stainless steel heating chamber and heating element, delivers high heat on demand. The unit along with 1000 watt heater can be operated on a single power cord, which gives it the versatility to be used in a variety of settings. The heater can be removed in seconds if a repair is necessary, and the stainless steel heating chamber comes with a lifetime guarantee. 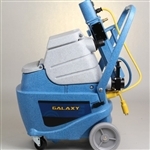 The Galaxy 5™ is an obvious choice for auto detailing and those jobs where a small yet powerful unit makes more sense. Exclusive 1000 watt external heating system for on-demand heat up to 170 degrees. Stainless steel heating chamber with lifetime warranty. "No drip" motor cavity guarantees water spilled on the outside of the machine stays outside and won't accumulate in the motor compartment. Exclusive removable heater for quick service and no down time. Silencer system for quiet operation. Heating chamber tested to 2500 psi to insure quality. External heater design removes heat from the motor compartment keeping the internal parts cool. Powerful 3 stage vacuum motor for increased recovery and quicker drying time. Built-in 1500 watt solution heating system for uniform temperature control without solution flow reduction. 5-Gallon hygienic stainless steel solution and recovery tanks. Single power cord for one circuit operation; runs on 12 amps. High-impact, chemical resistant housing with conditional lifetime warranty--virtually indestructible! 60 psi high-efficiency solution pump. The Therminator DV12 is Thermax’s newest industrial steam cleaner aggressively removes dirt, grime, odors and other embedded pollutants with unmatched efficiency; powerful dual two-stage vacuum motors (165” water lift) for faster cleaning; increased recovery speed and quicker drying time; built-in 1800 watt solution pre-heating system for quick, uniform temperature control (Heats to 175°); 11-Gallon hygienic stainless steel solution tank; 12-Gallon large capacity recovery tank with automatic overflow protection shut-off and waste gate empty system; single 25' power cord for one circuit operation; High-impact, chemical resistant housing with conditional lifetime warranty - virtually indestructible; 100 psi high-efficiency demand solution pump; Engineered for mobility and stability, tip resistant operation; Built-in dolly handle for greater control and maneuverability; Large 8” rear wheels make it easy to go up and down stairs; Marine sealed switches.